Visitors to Galveston have lots of options to beat the summer heat. Aside from Galveston’s popular beaches, there are water parks, boat excursions and, of course, air-conditioned attractions and museums. Schlitterbahn Water Park. Schlitterbahn Galveston is an indoor and outdoor water park with more than 30 attractions. Palm Beach at Moody Gardens. Following a major renovation, Palm Beach now offers its own Lazy River and Wave Pool. Palm Beach is ideal for small children and toddlers. 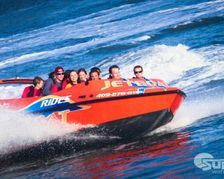 Jet Boat Thrill Rides at Pier 21. Plan to get a little wet on this new and exciting thrill ride through Galveston’s historic harbor and ship channel. Galveston Harbor Tours aboard the Seagull II at Pier 21. This excursion is operated by the Galveston Historical Foundation and offers a history of the port as well as other interesting facts. Baywatch Dolphin Tours at Pier 21. Another option for touring Galveston’s historic harbor and even catching a glimpse of a dolphin. Pier 21 Theater. Pier 21 Theater now offers three documentaries: The Great Storm, The Pirate Island of Jean Laffite and Galveston– Gateway on the Gulf. Haunted Mayfield Manor and Pirates! Legends of the Gulf Coast. These two new attractions are located off Saengerfest Park. The Manor is more appropriate for older children or young teens while Pirates is very family friendly even for the little ones. Ask about their discount combo ticket. Bishop’s Palace. This 1892 house museum has been open for tours for many years but it is now operated by the Galveston Historical Foundation. It’s definitely worth the visit if you have an interest in architecture and history. Moody Mansion and Museum. This is definitely one of the most magnificent homes in Galveston. You will see the home of one of Galveston’s most wealthy families. Hall of History at Hotel Galvez & Spa. 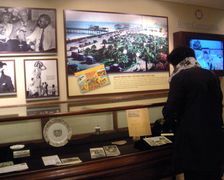 As part of the 2011 centennial, Hotel Galvez added a permanent exhibit on the history of the hotel. The exhibit is open to the public and often offers rotating exhibits presented by Rosenberg Library. Enjoy your stay and don’t forget your sun block.